Japanese international channel NHK World has launched a free video-on-demand service, enabling viewers to catch-up on recent programmes screened on the channel. In addition to being able to replay recent news programmes, the new player provides a selection of content from its factual and lifestyle programme genres, featuring insights into life in Japan, East Asia and the world. Although the service doesn't include the full range of NHK World programming, current highlights available on the service include a taste of Japanese cuisine in Dining with the Chef. Rail enthusiasts can catch up on the Japan Railway Journal and its report on diesel hybrid trains from the country known for its state-of-the-art railways. Journeys in Japan gives viewers an insight into life in Japan. 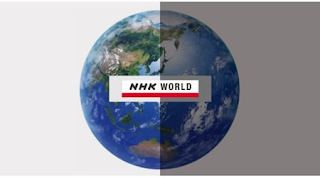 The live version of NHK World is available on Sky HD channel 507, Freesat HD channel 209 and Virgin Media channel 625, as well as via the TVPlayer on connected Freeview channel 241 and via the TVPlayer website and apps.